10 Best Ice Skating Rinks in Iowa! If you are looking for a little time on the ice in Iowa, well then, you’re in luck. The state of Iowa doesn’t only have quantity in ice rinks, but they have quality as well. Top-notch facilities open to all ages and spread across the state, Iowa ice skating rinks offer everything from adult hockey leagues to open skates. So if you’re in Iowa and looking to lace up your skates, be sure to check out these 10 great ice skating rinks in Iowa. Centrally located in the state, the Metro Ice Sports Facility offers every type of traditional fun you can have on the ice. Whether it’s hockey, ice skating or learning how to do both, the Metro Ice Sports Facility has it all crammed into a full day’s schedule. Find the time that is right for you, whether it’s open hockey night or a private birthday party, and have yourself a fun outing at the Metro Ice Sports Facility in Urbandale. 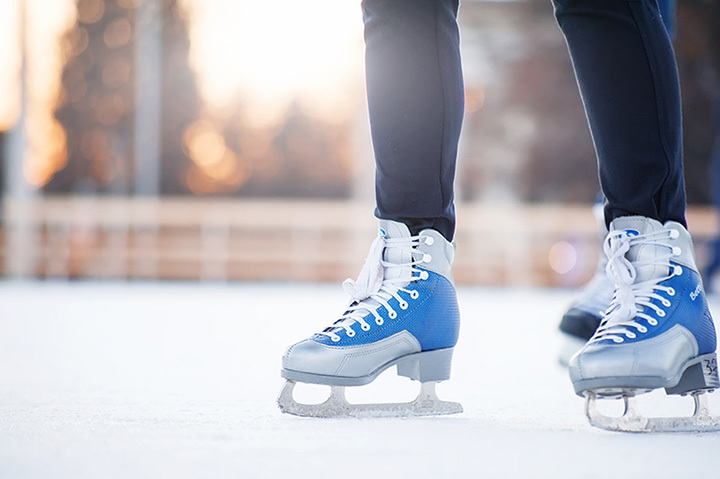 It might cost you a little less to visit the Iowa State University Ice Arena located on Gateway Hills Park Drive if you’re an actual student, but all members of the public are welcome to put on their skates and get on the ice. Offering public skate, hockey leagues and chances to practice your freestyle routine. They also published their facility calendars at least a month in advance on their website. River’s Edge in total comprises of a sizeable indoor turf field and an Olympic sized ice skating rink owned and operated by the city of Davenport. This impressive space offers a lot of fun, and if you stick toward the ice skating side of things you can enjoy public skates, freestyle slots of time and an “over 30” hockey league. Check out their latest month’s schedule to see what activity best fits your ice skating needs. Home of the Dubuque Fighting Saints, the Mystique Community Ice Center is a multi-million-dollar ice rink open to all ages and members of the public. Whether you are looking to get in a little stick time or you want to attend a full-blown ice skating or hockey clinic, even if you want to rent out the entire arena for just you and your friends, the Mystique Community Ice Center and its friendly staff will ensure that you enjoy yourself. The IBP Ice Center in Sioux City offers open skate times to the public on Friday and Saturday evenings from 7-9 p.m. Outside of these hours, the best time to get on the ice in Sioux City is to join in on the different events they host during the year. Featuring classics like “Learn to Skate” clinics and contemporaries like curling classes, check out their website for a full view of the different events happening at the IBP Ice Center. Located in the heart of the Great Lakes of Iowa, the Boji Bay Ice Arena offers everything you’d expect out of an ice arena, including hockey, figure skating, lessons, rentals and even during the “off-season” (summer), they melt the ice and feature a youth lacrosse league. Whether you’re looking for an adult hockey league, or time to practice your freestyle routine, why not head to the beautiful Spirit Lake and the Boji Bay Ice Arena? If you’re looking to get on some ice but out of the rink, the Terry Trueblood Recreation Area, in conjunction with the privately-owned H2O Center, can help anyone get on the ice. If you already own a pair of skates, then you can get on the iced-over Sand Lake anytime of winter when it’s cold enough. If you need to rent a pair, the H20 Center offers daily time-slots to come check some out. Either way, even without the Zamboni, the Terry Trueblood Recreation Area is a real ice-skating treat. Nothing ties off the winter season quite as right as ice skating at the Brenton Skating Plaza in Des Moines. Open seasonally, this welcomed winter attraction offers open skating hours nearly everyday in the winter, and if you feel a little uneasy on the ice, Brenton Skating Plaza also offers “Learn to Skate” clinics to sharpen your skills. Home to the Cedar Rapids Rough Riders, Eastern Iowa’s United States Hockey League team, the Cedar Rapids Ice Arena has everything the ice can offer for those year-long ice skaters out there. With open ice everyday of the week for freeskate, you can also take programmed “Learn to Skate” lessons, among many other activities including hockey, broomball, curling and private events. Connected to the Coral Ridge Mall, the Coral Ridge Ice Arena offers some of the finest ice in the state. With public skating hours every day (see schedule for hours), there’s no excuse holding you back from checking out the fun to be had. If you’re interested in learning and playing hockey, the Coral Ridge Ice Arena has you covered, and same with figure skating. Every last Friday of the month is Free-Family Friday, so mark your calendars and plan on checking out the Coral Ridge Ice Arena. View more Iowa Ice Skating Rinks.